The sleepy little town of Mill Basin is about to get more than it bargained for. The satanic heavy metal rock band “Black Roses” is coming through to raise hell… literally! After making a deal with the Devil himself, the band’s music demonically possesses the kids in the audience, turning them into blood-thirsty demons. The blood flows as they start killing their parents and causing chaos at their local high school. 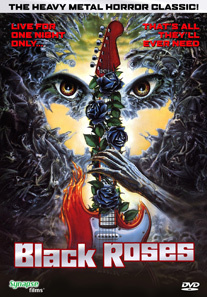 Culminating in a fiery battle between man and ultimate evil, BLACK ROSES is considered a “MUST HAVE metal horror movie from the 80’s” (IMDB.COM). From the director of ROCK ‘N’ ROLL NIGHTMARE comes the next heavy-metal horror classic re-mastered in high definition. BLACK ROSES features an early film role for Vincent (THE SOPRANOS) Pastore and classic rock fans will love seeing Carmine Appice (of VANILLA FUDGE) on-screen as one of the demonic “Black Roses” band members! The heavy metal soundtrack features original music from LIZZIE BORDEN.